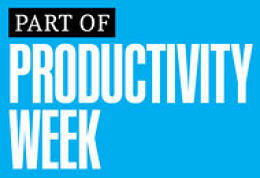 Ever wondered if productivity experts practice what they preach? We took a look at their workspaces to find out. Do you ever wish you could peek inside the offices of productivity and organization experts to see how they set up their own workspace for maximum efficiency? Organizing guru Peter Walsh, author of It’s All Too Much: An Easy Plan for Living a Richer Life With Less Stuff, says he imagines his desk like a car. Everything you need most immediately–the steering wheel, radio, ignition, indicators, door handle–is at arm’s length. Things that are needed but not used regularly are two-arms’ lengths away, such as in the glove compartment, and the things used infrequently are in the trunk. Your desk is a workstation, not a storage facility. Productivity king David Allen, author of Getting Things Done: The Art of Stress-Free Productivity, needs just a small desk in his Amsterdam office to get stuff done. He says a desk should hold four things: supplies, reference materials, decorations, and equipment. Anything else should go somewhere else. The most important tool on her desk, however, is her Balanced Life Planner, a product she designed herself, she says. Once you start leaving things out, it becomes visual Muzak and distracting. Peter Bregman, author of Four Seconds: All the Time You Need to Stop Counter-Productive Habits and Get the Results You Want, has two workspaces: a standing desk and his lap. “I hate clutter, I’m hyperorganized, and I keep nothing unnecessary on my desk. I don’t even have drawers lest I want to put useless things inside of them,” she says. The most important thing about her desk is that it’s huge–6.5-by-3-feet–“so there’s lots of room to play,” Glei says. Three things have a permanent home on the desk: her MacBook Air, a 12-by-9-inch Strathmore sketchbook for exploring ideas, and an FAF pad for jotting down things that need to get done. As CEO and founder of The Container Store, Kip Tindell has access to myriad organizing tools to keep his desk tidy, but he’s very selective about what he uses. “I like to keep my work surface as open and clutter-free as possible since I prefer to be out, interacting with others instead of cooped up in my office,” he says. Tindell uses stackable desktop organizers from his company’s Like-It Collection to hold office essentials. His desktop also holds a selection of books written by colleagues and friends. (Currently he’s reading Firms of Endearment by Rajendra Sisodia and It’s Not What You Sell, It’s What You Stand For by Roy Spence, Jr.) And decorating the surface is a collection of seven colored blocks that represent his company’s seven Foundation Principles, which guide everyone on how to treat employees, customers, vendors, shareholders, and the community with respect and dignity. Since his desk is streamlined, Tindell says it typically doesn’t get too unruly: “As you can imagine, we like to keep things well organized at The Container Store,” he says.